While living in the Pacific-Northwest, he opened a small studio in Olympia producing albums for acts as diverse as Bikini Kill and Modest Mouse, and found some success in the Washington music scene. In 2001, at the insistence of his wife, he returned to Oslo with his three sons (he has five children). In 2003, he recorded his first album under the moniker Seasick Steve, titled Cheap; which began to establish a foothold in the UK for him. With momentum in hand, devastation struck when in 2004 he suffered a heart attack. While home and finding a way of life he could sustain post-heart attack, his wife pressed him to start recording on his 4-track. Those sessions would become the 2006 release, Dog House Music; which was independently released on the Bronzerat label (200,000+ copies sold). His follow up album, I Started Out With Nothin’ And I Still Got Most Of It Left, found Seasick Steve landing his first platinum album and critical success overseas. Focusing on a “live” analogue sound, the new album, Man From Another Time was produced, written, recorded and engineered by Seasick Steve, with the assistance of engineer Roy Williams. Buy: (Amazon UK)Man From Another Time . 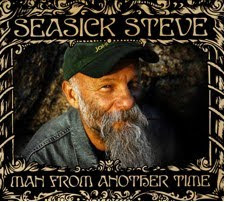 The U.S. release of Seasick Steve’s Man From Another Time is through Ryko on March 30th, 2010. 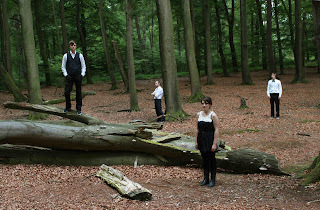 The Black Atlantic are from Groningen (The Netherlands), They are an acoustic pop quartet, formed around singer-songwriter and former Shai Hulud front man, Geert van der Velde. The band’s folk influenced sound is reminiscent of Bon Iver or Sigur Rós. The band pairs lush, dreamy melodies with softly layered vocal harmonies and minimal percussion. Exuding formidable intimacy and heartfelt urgency, the Black Atlantic are (according to their promo) contenders to be one of the biggest surprises of 2010. I would not be surprised if this happens, put quite simply, I find their music both soothing and moving, as much as I have given Seasick Steve an unashamed plug I heartily recommend giving this band a listen. AOL Spinner described their sound as “ethereal and evocative”, while Slam Magazine called it “bright and refreshing”, and Drive Wayferer Drive hailed it as “lovely without being precious, ambitious without being alienating”. The Black Atlantic are heading out to Austin, TX to perform at the 2010 South by Southwest Music Festival (SXSW) this week. This will mark their maiden trip to SXSW After their five-day stint at SXSW, the band will embark upon a spring tour of the US, making stops at major cities including New York and Chicago. OK I am going to blast through a few other artist that have come the Beehive way in recent weeks and who have made us look up and take notice! Zachary "Ulysses Campbell" Wilson is a product of the DIY generation and proud of it. 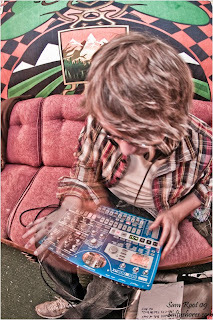 He records primarily on an 8 track, edits with freeware, and plays shows whenever a party is happening. Sometimes there may be two other guys playing with him, sometimes it’s just Ulysses Campbell solo - but it’s always high energy; which in itself mirrors the frantic style of Ulysses Campbell. While maintaining basic pop instincts, Ulysses whirls through an ever changing thrash of electro, drum n bass, 8-bit, dub step, and all around ill beats. Standout track "Dinosaur Hunting" begins with a bit of a Mt. Eerie/Microphones feel, and about halfway through the beat drops in true Ulysses style. The song was written mere hours before his departure on his six month journey in South Africa; his mood well captured in the vocals and musical progression. Recently nominated for Ireland's Choice Music Prize, Belfast's And So I Watch You From Afar are heading across the pond for SXSW as part of their huge Euro/American tour. They cut their teeth touring around Europe for an incredible 170 shows in 2009 alone, including the Pukkelpop Festival in Belgium and the Novarock Festival in Austria. The year also saw the release of their debut full length and EP in Europe with upcoming street dates yet to be determined in the US. For fans of Explosions in the Sky this will be the band to watch. FlyinFisch, the new project of modern-day-renaissance-man Adrian Fischer, is set to release its self-titled debut album on March 19th. With each song representing a unique exploration into the experiences and cultural influences that have formed his musical identity, Fischer’s new album is a sonic journey that should not be missed. With tour dates throughout February to support the upcoming release, Adrian is pleased to be hitting the road again, and introducing his material to new audiences. If you try to pinpoint where Adrian has been the last ten years, you’ll notice that he hasn’t stayed in one place for very long. Having lived everywhere from Venezuela to New York City, and many places in between, Adrian Fischer’s story is one of travel, exploration, and evolution. The resulting musical sound is as difficult to characterize as Adrian is – influenced by the tones and sounds of each place he has lived, his style is a blend of classical, reggae, pop, and afro-Caribbean influences, with each element representing a snapshot in his decade-long journey. In FlyinFisch’s debut album, Adrian has brilliantly fused his influences into one solid and united offering. While still clearly referencing the cultures and sounds that inform his music, Adrian has now moved a step further, developing a sound that is uniquely his own. With an interest in the natural world linking many of the songs together, and a desire to promote what Adrian calls “positive consciousness” providing the album’s context, FlyinFisch’s first offering is meant to be enjoyed by audiences of all ages and cultures, who will hopefully be brought together by Adrian’s message of unity and love. San Diego's Tropical Depression (Jordan Thomas and Joe Campesino) have played in a variety of bands together before deciding to form their current indie electronic two-piece, but are already on their third album release in four years. Their sound has been described as "grunge, electronic, nu-gaze, and a hint of 90s emo" by The FMLY. Their band consists of a twelve string guitar, bass, electronics and vocals. "As multi-instrumentalists we both usually come to the table with ideas," says Thomas, "and follow the songs wherever they go. The single best thing about being in a two piece band is direct one-on-one collaboration." Tropical Depression has just released the album Years On Years (November 2009), which was recorded and produced by Pall Jenkins (The Black Heart Procession, Three Mile Pilot).